At the Lagos International Trade Fair that kicked off this weekend, garri that was made, and packaged Ghana stole the fair. According to a report by News Agency of Nigeria, many Nigerians queued up during the fair scrambling for the made-in-Ghana garri. 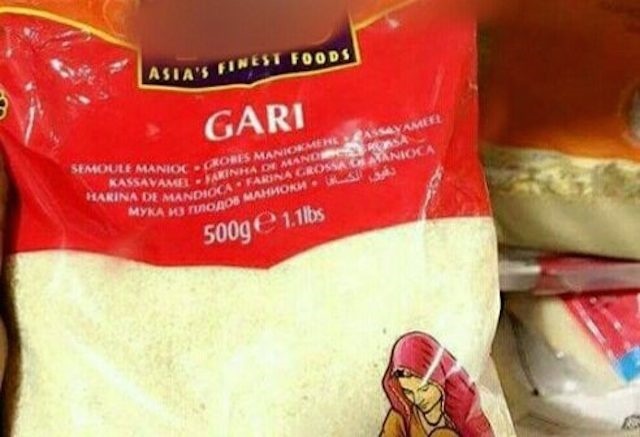 The report said the product, which was neatly packaged in 125 grammes sachet and labeled “Crispy Gari Mix’’, was on display at the Ghana stand at the Fair. The product was mixed with groundnut and sugar and was being sold for 170-naira per 125g at the Ghana stand. Many Nigerians were seen waiting patiently for their turns to buy and taste the Garri packed in attractive blue and white sachets. The Commodity Manager, Mr Ernest Boateng, was quoted as saying that he was highly impressed with the sale within two days of showcasing the product in Nigeria. “I am surprised at the high patronage between yesterday and today, amongst other product we brought for sale, this one sells more,” he said. Mr Oshodi Tunde, one of the buyers, who was seen eating the product directly from the pack, advised Nigerians to copy the innovative idea. “Nigerians should make use of this idea by packaging Garri with sugar and groundnut for sale too. “We should stop looking for white collar jobs and try to do something meaningful with our country’s resources,” he said.